I went to the SF Mime Troupe‘s ‘Red State’ last week. It was a musical political satire about a small town in Kansas that ends up holding the deciding votes in the next U.S. federal election. Some of my early theatre going experiences were going to Mime Troupe shows. It was always such a great gathering of people. Usually in a Berkeley park, picnics, sunshine, and loud broad comedy with an sharp political edge. It was glorious to hear a group of 100s of likeminded people guffawing at the foibles and faults of our elected officials. I loved it. 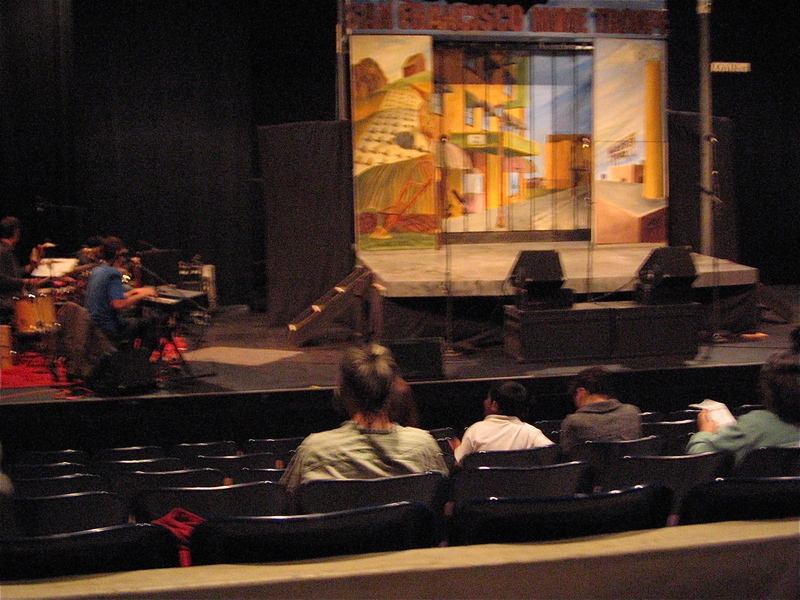 The performance I went to last week was at Laney College, indoors. There’s something, intangible I think, but perhaps definable about theatre out of doors. The way the voice carries from actor to audiences’ ear, the vulnerability of performance naked under the elements, the fresh air… all this adds to the experience in what can be an almost perfect mix. So this performance didn’t have the same kind of magic, but I was thankful for the opportunity to see some of my teenage idols again with fresh eyes and ears, and a more political heart.